Actress Bérénice Marlohe has been added to Omega’s roster of brand ambassadors and participated in the opening of the brand’s new boutique in Venice yesterday. The French actress portrays Séverine in SkyFall, the James Bond film to be released in November.This might mean that Marlohe will wear an Omega watch in SkyFall, just like her fellow brand ambassador Daniel Craig. 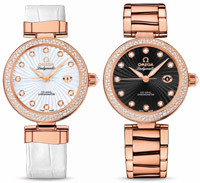 At the press conference yesterday, Bérénice Marlohe was wearing an Omega DeVille Ladymatic, red gold with white leather strap, and she was also spotted at a photoshoot in Venice wearing an Omega DeVille Ladymatic in red gold with black dial and red gold bracelet (see images on the right), so it could very well be that we will see her with an Omega DeVille Ladymatic in SkyFall. Opening of "our Venice branch, of course". Bond Girl Bérénice Marlohe during a photoshoot in Venice wearing an Omega Deville Ladymatic, red gold case on a red gold bracelet, black dial (reference 425.65.34.20.51.001). Visit the Omega website for a short intro movie for the Omega Seamaster James Bond 50th anniversary edition.